The weekly devotional speaker has just offered their closing remarks. The BYU-Idaho Center’s lights turn on — the organist’s signal that it is time to start. Surreptitiously, the organist plays the opening chords of the closing hymn. Across campus, organ emphases perform, go to class and live among other students. Katelyn Fitzen, a senior studying music with an emphasis in organ performance, said the coolest thing about emphasizing in organ performance is the look she receives when she tells people she’s emphasizing in organ performance. “There are so few of us that when people find out you play the organ, they give you this look of, first of all, ‘I’ve never heard of that, why would you do that,’ but also this respectful like ‘Dang, that’s kinda cool,'” Fitzen said. 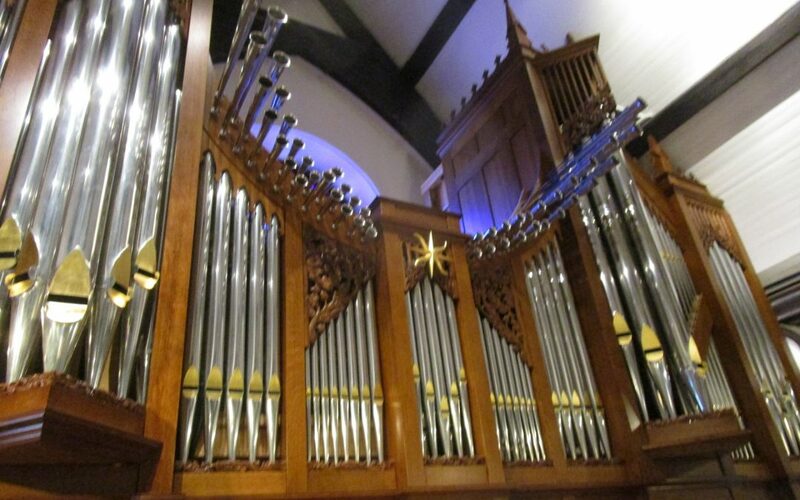 Organ emphases perform in various capacities across campus, most notably in devotional. “When it comes to devotional, you have your own end to worry about and prelude and postlude,” said Andrew Woodruff, a senior studying music with an emphasis in organ performance. Organists have to worry about and practice hymns, postlude and prelude. A lot of work goes into preparing for devotional. Every Monday at organ master class, the devotional chorister and organist run through the hymns together, practicing the hymns for the following day and checking for perfection. After the chorister leaves, the organist is expected to know what they will wear the following day if their hair will be brushed, the length of their final prelude piece and much more. “The kind of work we have to put into something so simple — like in devotional when we play, people don’t even pay attention — but it has to be drilled into us because it has to be perfect,” Fitzen said. Woodruff said playing in devotional and at convocations are great opportunities for organists, most of whom will move on to work as church musicians. As organists, we have a unique opportunity to regularly play individually for the entire university community that other musicians rarely, if ever, do. With that opportunity comes a responsibility to play well. Beyond devotional, organists have many other opportunities to perform. Woodruff said in order to fulfill their ensemble credits, many of them take choir classes. Organ emphases get to play a dual role as instrumentalists and singers. “I like to see us as the bridge in between the two since we know what goes on in both the worlds,” Woodruff said. Many organ emphases seek opportunities outside of school to play the organ. Last fall, Fitzen auditioned at an American Guild of Organists competition and won. The prize was a scholarship for an American Guild of Organists convention in New York. Woodruff has sought opportunities to work as an organist for other churches. Behind the consoles, manuals, stops, hymns and pipes, organ emphases play impeccably-practiced music weekly. Each of them has a unique reason for choosing the somewhat obscure instrument.